Tom Hanks took to the stage last weekend as we’ve never seen him before — in a fat suit as a barreling and rambunctious drunk. 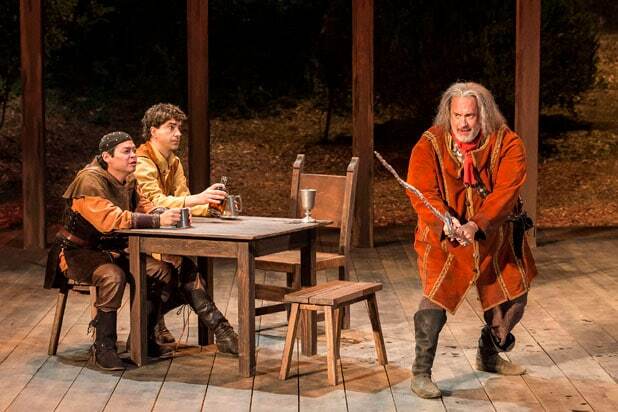 No, he wasn’t appearing in a “Saturday Night Live” skit, but instead bringing one of William Shakespeare’s most iconic comedic characters to life: John Falstaff in the Shakespeare Center of Los Angeles’ production of “Henry IV,” now playing through July 1. While the Oscar winner consistently captivated in his L.A. stage debut as the overweight, vain and boastful cowardly knight who befriends the future king of England, the outdoor setting for the play could not have been more tranquil. The intimate stage at the Japanese Garden on the West Los Angeles VA Campus had a natural wooded backdrop, twinkling lights and bubbling streams that swept the audience far away from the hustle of the nearby 405 freeway and transported them to 15th-century England, setting the tone for both violent battle scenes and tavern gatherings. And what an audience it was, with the lead actor’s wife, Rita Wilson, and son Colin Hanks among the 620 guests sitting in the garden surrounded by eucalyptus trees and wrapped in forest green blankets. The Shakespeare Center, in partnership with the West L.A. VA, also donated 2,000 tickets for eligible veterans and active members of the military. As a 21-year-old student, he also appeared in “The Two Gentlemen of Verona” and “Macbeth” at the Great Lakes Shakespeare Festival in Cleveland. 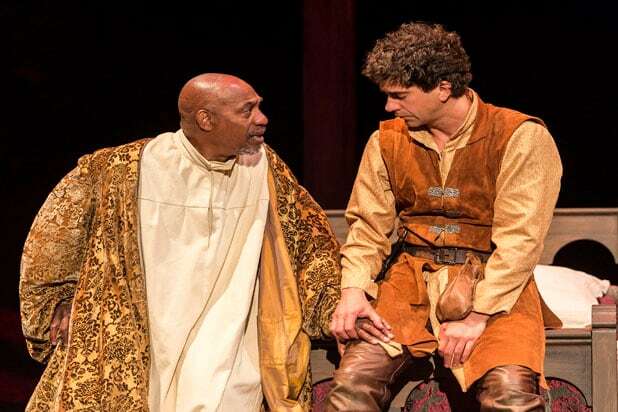 In his latest trip to Shakespearean England, Hanks was joined by Hamish Linklater (“The Crazy Ones”) as Prince Hal, Joe Morton (“Scandal”) as Henry IV and Tony winner Rondi Reed (“August: Osage County”) as Mistress Quickly. The production was directed by Tony winner Daniel Sullivan, with Ben Donenberg as artistic director and Tom Ware as executive producer. Anthony Mark Barrow (Lord Bardolph, Vernon), Raffi Barsoumian (Hotspur, Pistol), Josh Clark (Worcester), Benji Coelho, James Michael Cowan, Jeff Marlow (Archbishop, Sir Walter Blunt), Chris Myers (Lancaster, Peto), Alexander Pimentel, Ray Porter (Douglas, Warwick), Chris Rivera (Poins), Emily Swallow (Lady Percy), Peter Van Norden, Geoffrey Wade (Westmoreland), and Time Winters (Bardolph, Mowbray) complete the cast. Capturing both the drama of the ultimate coming-of-age story and a boisterous comedy packed with trash talking and fat jokes (“Falstaff sweats to death,” quips Hal after a prank involving a highway robbery), Sullivan combines “Henry IV, Part 1” and “Henry IV, Part 2” into one play with a running time of three hours and 20 minutes. 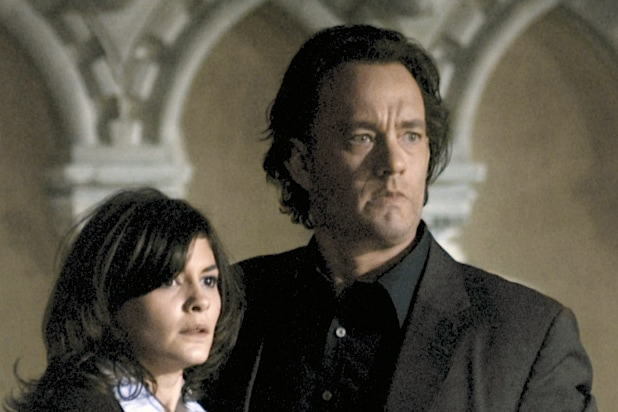 It’s been a while since we’ve had the pleasure of Hanks’ comedic talents in classics like “Splash,” “Bachelor Party” and “Big,” but his natural humor hasn’t faded over the decades and he brings effortless energy to the often-drunk, degenerate jester. Many of the most compelling moments are between Falstaff and his ne’er-do-well protégé Prince Hal, who ambles through life like an amiable puppy until his father summons him to court in the wake of the revolt by Mortimer and the Percys. Barsoumian’s intense Sir Henry Percy acts as a fitting antithesis to Linklater’s infantile Hal. Falstaff is famed for being able to twist the truth of any situation and spin lies with the blink of an eye, a skill that Hanks tackles with relish as he seems to genuinely enjoy this open-air escape from his recent dramatic roles. He attacks every scene with the intoxicating fervor of the character himself, whether he is struggling to stand up because of the weight of his belly or bantering with Boar’s Head Tavern owner Quickly (who was originally meant to be played by Wilson). When Hal finally does banish both his childish ways “and sweet Jack Falstaff” to be crowned King Henry V, it is Hanks who is left standing alone on the stage as the lights dim around him. Hanks and Wilson have supported the Shakespeare Center of Los Angeles for over 26 years, hosting and participating in Simply Shakespeare, a no holds barred impromptu reading of a Shakespeare comedy with celebrity casts and musicians that raises funds and awareness. “Henry IV” runs through July 1.